While everyone knows about the AppV_Manage tool, used for testing new App-V Packages, many either do not know or have forgotten about two of the other tools. In fact, unless you were already using them you probably didn’t notice the updates last September. I recently noticed that I totally forgot to blog and tweet about the changes. Well even newer updates are now out so let’s catch up on these two awesome tools. 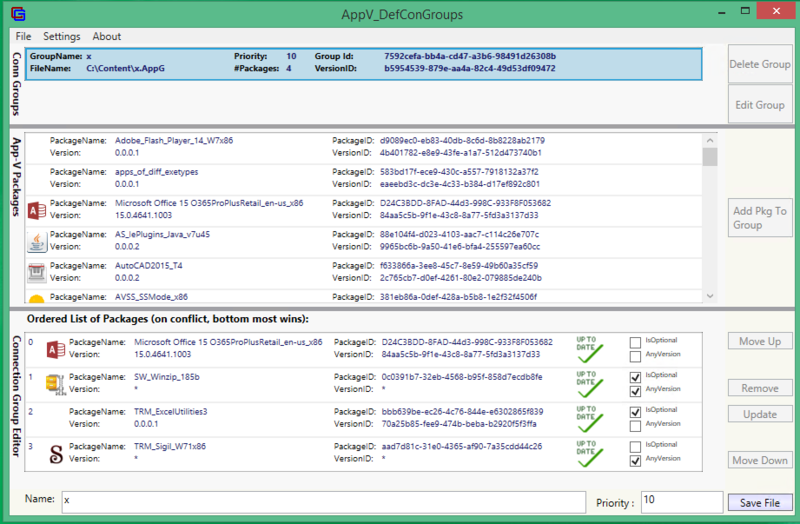 App-V Define Configuration Groups is a free GUI tool to create the Connection Group xml files needed if you want connection groups and don’t use the App-V Management Server or the SCCM 2012 Integration for App-V.
You use the virtual MSIs to distribute because you have an older SCCM or a different ESD system. Or you use the latest SCCM, but want the new connection group features or just don’t like how every client gets a different GUID with Virtual Environments. Or you use the client PowerShell for a build script to load up virtual apps, and want to add Connection Groups. Or you use the AVSS tool to distribute App-V packages and want connection groups also. First of all, it is an editor. It is used by an Administrator. Install the GUI tool, and point it to the share where you store your packages. Start the GUI and you can create connection group files with clicking buttons. By default these will be stored at the root of your registered package share. The files will use an AppG file extension which the tool registers so that you can quickly double-click on a file to view/edit. But when you launch the tool, it inventories package versions to alert you to AppG files that need updating due to “active upgrade” package versions that have been added to the share. This was more important prior to 5.0 SP3 connection group changes, but you probably don’t have all your groups marked for the “any version” option. What’s new in the latest versions? Support for App-V 5.0 Sp3 Connection Group features (any version, and optional package). AVSS is a free alternative deployment mechanism for App-V Packages. It is completely server-less, has no administrative console or database, and yet can distribute App-V packages and AppG files to users and machines throughout the enterprise. It has two major modes,automated distribution and self service distribution. What the F***? How can that be? AVSS uses only the two back-end things that any distribution system would need, a central share to hold the packages, and optionally Active Directory to provide authorization. If you use AD, it simply relies on a naming trick that you probably already use: AD Security Groups that have names matching that of the App-V packages. So no admin consoles, no databases, no back end configuration files feeding (and becoming a dependency for) the distribution. It is a 100% pull technology, based on a windows service added to the App-V clients. So from a performance standpoint, the only limitation for scale is the disk performance of your package share. So let’s talk about the two ways it generally gets used. In this mode, you have a simple replacement for the App-V Server. Put your packages in the share, create the Application Groups in AD (if you want to integrate with AD). Install the AVSS service on client images and configure to point to the share and optionally the OU containing the AD Groups. Without AD integration, any package in the share will by published to the machine after boot. This is of use as sort of a boot script to bring in the virtual apps and keep them out of the master image. With AD integration, membership in the AD groups can be machine or user objects, and publishing will be done appropriately. Obviously user publishing doesn’t happen until login, but performance is the same (or slightly faster) than the App-V Management Server. In this mode, package authorization (without AD meaning it is in the share, with integration meaning user or machine assignment) does not automatically add and publish the package. Instead, a small GUI is also added to the client that allows the user to select which authorized packages to add, and whether to take updated packages. The “secret sauce” for Self-Service mode is that the GUI communicates with the service to perform the add/publish/remove actions, so the user does not need any elevated rights. What’s new in Version 2.2/2.3? Programmable timer for updating in automatic mode. User no longer needs to logout/login.